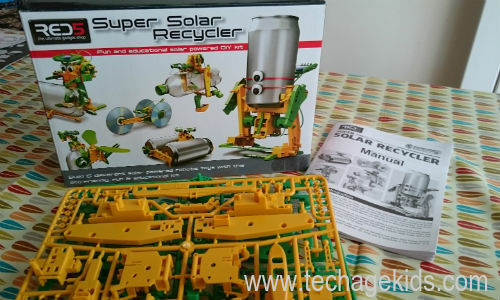 My 7 year old son, recently got a Super Solar Recycler for his birthday from a friend. Usually I'm a little sceptical of kits like these, as they tend to be fragile and tricky to assemble. However my son was super excited to make it and so we cleared the kitchen table, got all our tools and opened the box. My 4 year old joined us too and thoroughly enjoyed the experience. The kit came in rigid plastic sheets, with numbered parts that needed cutting out. This was too tricky for my son to do on his own, but it did mean we could all work as a team to build the model. My younger son, found the numbers on the sheet (with some help), I cut the pieces out and the older one built it. The kit can be built into 6 different robots. We chose to make the CD Racer first. We had some fun trying to figure out how the motor is put together and which way the gears needs to turn to make the racer go forwards. The instructions were slightly complicated for a 7 year old, but it wasn't too difficult to figure out in the end. My son loves science and exploring the world around him. 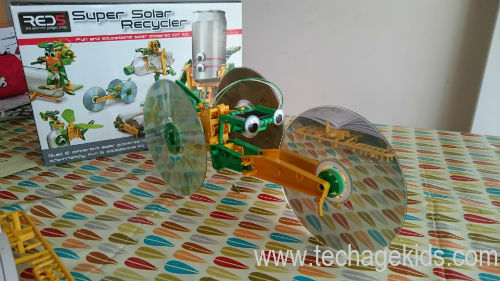 This kit was a perfect starter project to explore how solar energy works. When we finished our CD racer we took it outside to test. Thankfully it was a sunny day to make it move. I was genuinely impressed at how well it worked. The kids excitedly danced around the moving vehicle and we soon discovered every time their shadow fell on the solar panel it stopped working. This sparked many great questions and discussions about how solar power works. We found this video on "The Kid Should See This" on solar power. The next morning we made the Drummer Robot, using an empty tin can. Unfortunately we had to take the CD Racer apart to make it, but the pieces are very durable and I imagine we will be able to make each of the 6 models in the kit over and over again. My son made a little video about the Drummer Robot, which he is planning to use towards his summer badge scheme with diy.org. 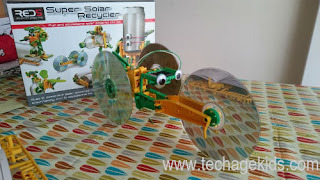 We got to experiment with solar power and building a motor and I didn't have to be an engineer to figure it out. It provided hours of fun family time engaging both my 4 and 7 year olds. The robot didn't work on a cloudy day. In order to make the models you need some of your recycling, thankfully we had 3 old CDs and tin cans, but we had to wait a week for the large plastic bottle to be empty. The pieces were tricky to prepare, but once all the burs were sliced off, they fitted securely together. I was pleasantly surprised by the quality of the Super Solar Recycler and definitely recommend it for anyone interested in a fun and easy experiment with the kids. I will be adding it to my list of gifts to buy for kids parties in the future. I think it's time we try building the Bottle Yatch tomorrow.